In April 1909, Alfred Edward Hobbs, 16 year old son of Alfred Edward Hobbs Senior (a mason’s labourer), was indentured, for four years and 9 months, as an apprentice moulder to Thomas S Colbourne of Barnstaple, an ironfounder. Specifically the indenture describes his apprenticeship ‘in the Art trade or business of ironfounding’. For this Thomas Colbourne agreed to pay four shillings per week in the first year, five shillings a week during the second year, six shillings per week during the third year, seven shillings a week during the fourth year and eight shillings a week for the last 9 months. 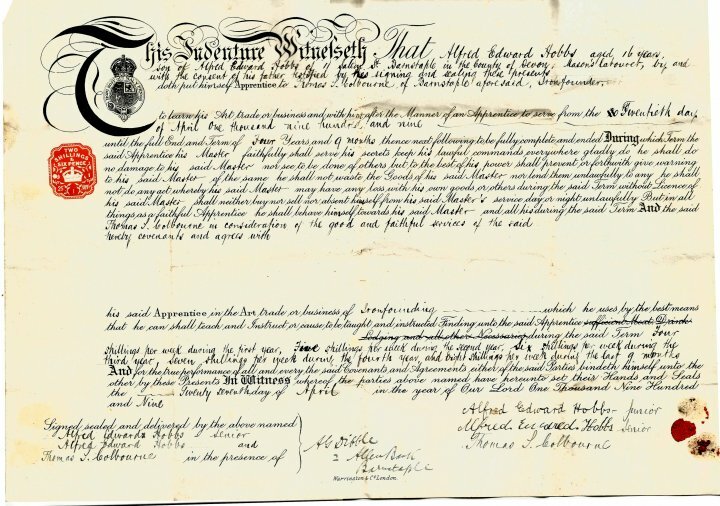 The indenture document was signed by Alfred Edward Hobbs Senior, Alfred Edward Hobbs Junior and Thomas Colbourne and witnessed by A G Dibble of Allen Bank, Barnstaple on 27th April 1909. Thomas Colbourne, originally from Leamington, Warwickshire, was identified in the 1911 census as an Engineer and Ironfounder, aged 45 years, living in Newport, Barnstaple. The name, timing and occupation suggest that this was the man to whom Alfred was apprenticed. Alfred Edward Hobbs Junior was born in 1893 and married Jane Bartlett in the Church of St Mary’s, Pilton in July 1920. The wedding is reported elsewhere in The Pilton Story. Unfortunately, there was little work in the trade of ironfounder in Barnstaple, so the couple moved to Pembrey, Camarthenshire, Wales where Alfred worked in the Pembrey Iron Works. Their daughter, Jane known as Jennie, was born there in 1923. In the mid-1930s they returned to Barnstaple and lived in Priory Road and then Ladywell, Pilton, where Jennie lived for 80 years until she died in January 2018 at the age of 94. Many thanks are due to Mary Passmore, Jennie’s cousin, for passing this indenture to The Pilton Story when Jennie died and for filling in some of the family details.